^ 1.0 1.1 Foust, Jeff. SpaceX Breaks Ground on Texas Spaceport. Space News. 22 September 2014 [22 September 2014]. ^ Gov. Perry Announces State Incentives Bringing SpaceX Commercial Launch Facility, 300 Jobs to the Brownsville Area. Office of the Governor Rick Perry. governor.state.tx.us. [5 August 2014]. （原始内容存档于2014年8月29日）. ^ 4.0 4.1 4.2 Foundation Problems Delay SpaceX Launch. KRGV.com/5news (Rio Grande Valley, Texas). 18 January 2016 [20 January 2016]. ^ Huertas, Tiffany. SpaceX working to stabilize land at rocket launch site. CBS4 ValleyCentral.com. 2016-02-11 [2016-02-13]. ^ 6.0 6.1 Capabilities & Services. SpaceX. [14 April 2016]. ^ Berger, Eric. Texas, SpaceX announce spaceport deal near Brownsville. MySanAntonio.com. 5 August 2014 [5 August 2014]. ^ 8.0 8.1 8.2 8.3 8.4 8.5 Nield, George C. Draft Environmental Impact Statement: SpaceX Texas Launch Site (PDF). Federal Aviation Administration, Office of Commercial Space Transportation. April 2014. （原始内容存档于2013-12-07）. ^ Interview with Elon Musk. Livestream.com. The Texas Tribune: @15:20. 15 January 2015 [17 January 2015]. ^ Gleeson, James; Musk, Elon; 等. Block 5 Phone Presser. GitHubGist. 10 May 2018. 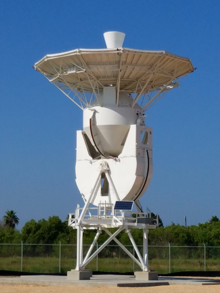 Our South Texas launch site will be dedicated to BFR, because we get enough capacity with two launch complexes at Cape Canaveral and one at Vandenberg to handle all of the Falcon 9 and Falcon Heavy missions. ^ 11.0 11.1 Perez-Treviño, Emma. SpaceX, BEDC request building permits. Brownsville Herald. 29 July 2014 [30 July 2014]. ^ Elon Musk's Futuristic Spaceport Is Coming to Texas. Bloomberg Businessweek. 16 July 2014 [11 July 2014]. ^ Klotz, Irene. FAA Ruling Clears Path for SpaceX Launch site in Texas. Space News. 11 July 2014 [16 July 2014]. ^ 14.0 14.1 SpaceX breaks ground at Boca Chica beach. Brownsville Herald. 22 September 2014. ^ 15.0 15.1 Perez-Treviño, Emma. Soil headed to Boca Chica for SpaceX. Valley Morning Star. 22 October 2015 [24 October 2015]. ^ 16.0 16.1 16.2 Foust, Jeff. The great state space race. The Space Review. 1 April 2013 [3 April 2013]. ^ Texas tries to woo SpaceX on launches. Daily News. 12 February 2014 [14 February 2014]. ^ Mark Hamrick, Elon Musk. National Press Club: The Future of Human Spaceflight. NPC video repository (video) (National Press Club). 29 September 2011. 事件发生在 32:30. ^ Dean, James. Proposed Shiloh launch complex at KSC debated in Volusia. Florida Today. 3 April 2013 [6 April 2013]. ^ Details Emerge on SpaceX's Proposed Texas Launch Site. Space News. 16 April 2012: 24. SpaceX is considering multiple potential locations around the country for a new commercial launch pad. ... The Brownsville area is one of the possibilities. ^ Rush, Johna Strickland. Spaceport could land in Camden. Tribune & Georgian. 15 November 2012 [20 November 2012]. （原始内容存档于2013年2月4日）. ^ FAA Notice of Intent to conduct an Environmental Impact Statement, Federal Aviation Administration, 3 April 2012, retrieved 8 April 2012. ^ 25.0 25.1 Nelson, Aaron M. Brownsville leading SpaceX sweepstakes?. MySanAntonio.com. 5 May 2013 [6 May 2013]. ^ 26.0 26.1 26.2 Perez-Treviño, Emma. FAA approves SpaceX application to launch rockets from Cameron County beach. The Monitor. 9 July 2014 [16 July 2014]. ^ Berger, Eric. Texas, SpaceX announce spaceport deal near Brownsville. Houston Chronicle. 4 August 2014 [4 August 2014]. ^ The New Residents: Renovation planned for house linked to SpaceX. Valley Morning Star. 29 August 2014 [30 August 2014]. ^ Berger, Eric. Texas reaches out to land spaceport deal with SpaceX. Houston Chronicle. 25 May 2012 [27 May 2012]. ^ Clark, Steve. SpaceX vendor fairs slated. The Monitor. 4 February 2015 [4 February 2015]. ^ Perez-Treviño, Emma. SpaceX prepping for construction. Valley Morning Star. 14 March 2015 [16 March 2015]. ^ Perez-Treviño, Emma. Solar project planned for SpaceX. Valley Morning Star. 6 August 2015 [1 September 2015]. ^ Swanner, Nate. SpaceX launch facility goes green, will have solar panel field. Slash Gear. 7 August 2014 [18 March 2015]. ^ Huertas, Tiffany. SpaceX construction causing problems for surrounding residents. ValleyCentral.com / KGBT-TV. May 18, 2016. ^ Foust, Jeff. SpaceX seeks to accelerate Falcon 9 production and launch rates this year. SpaceNews（英语：SpaceNews (publication)）. 2014-02-04 [2016-02-06]. ^ Clark, Steve. SpaceX moving two giant antennas to Boca Chica. Brownsville Herald. August 13, 2016. ^ Dean, James. With nod to history, SpaceX gets launch pad 39A OK. Florida Today. 15 April 2014 [15 April 2014]. ^ Clark, Stephen. SpaceX says robust market can support four launch pads. Spaceflight Now. 18 October 2013 [27 October 2013]. ^ David, Leonard. New Mexico’s Spaceport America Eyes SpaceX, Virgin Galactic Flights. Inside Outer Space. 7 May 2014 [30 July 2014]. ^ Clark, Steve. SpaceX chief: Commercial launch sites necessary step to Mars. Brownsville Herald. 27 September 2014 [30 September 2014]. ^ Gwynne Shotwell. Broadcast 2212: Special Edition, interview with Gwynne Shotwell (audio file). The Space Show. 事件发生在 03:00–0405:. 21 March 2014 [22 March 2014]. 2212. （原始内容 (mp3)存档于22 March 2014）. we are threading the needle a bit, both with the islands as well as the oil rigs, but it is still a good flight path to get commercial satellites to GEO. ^ Clark, Stephen. SpaceX may turn to other launch pads when rocket flights resume. Spaceflight Now. September 6, 2016 [September 8, 2016]. ^ Solomon, Dan. SpaceX Plans To Send People From Brownsville To Mars In Order To Save Mankind. TexasMonthly. 23 September 2014 [24 September 2014]. SpaceX gets preliminary FAA nod for South Texas launch site, Waco Tribune-Herald, 16 April 2013. Lone Star State Bets Heavily on a Space Economy, New York Times, 27 November 2014.